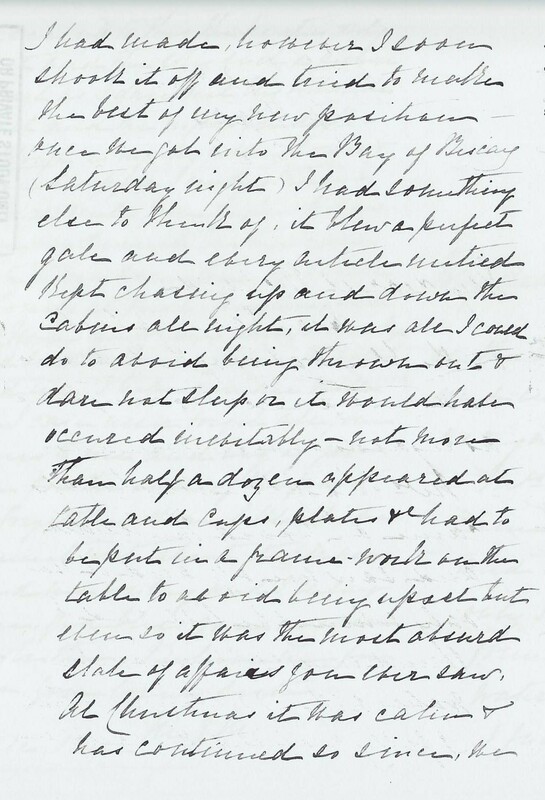 Letter from Marianne Morris (Rahilly) to her brother Richard Rahilly, Sat 29 Dec 1888 (NOT 1881), from the S.S. Liguria off Naples, on the way to Australia. [P102/33(1)]. See p.1 and p.2 and p.3 and p.4. 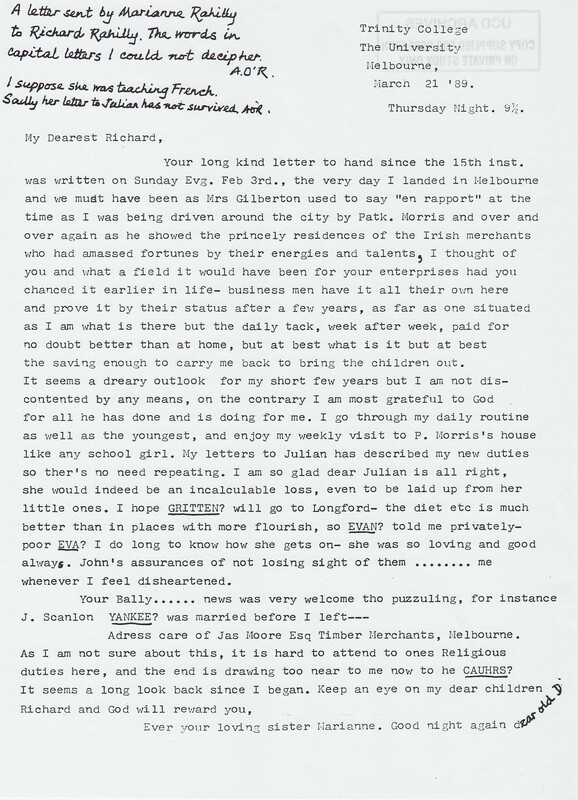 Letter from Marianne Morris (Rahilly) to her brother Richard Rahilly, Thur 21 March 1889, from Melbourne. [P102/33(2)]. See page 1 and 4 and 5 and page 2 and 3. See inaccurate transcript from [P102/548(24)]. Family tree by Morris Engelke, senior. Family tree by Morris Ryan. 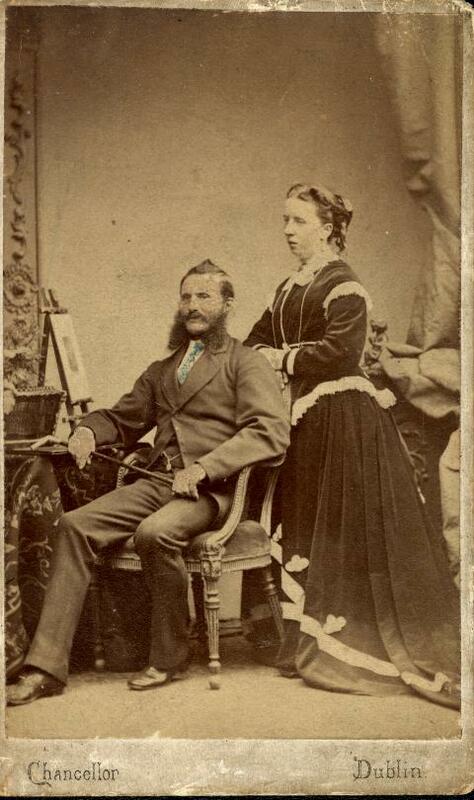 Robert Morris and Marianne Rahilly. Before 1881 (when he died). Taken in Dublin studio. See back. Picture courtesy of Morris Ryan. born 1836 (listed as age 32 at mar). Officer in the Inland Revenue. [Directory of Cork & Munster, 1867] lists him as the Inland Revenue Officer for Listowel, Co.Kerry. He is listed at William St, Listowel (see old map). At mar he is listed as officer in Inland Revenue, living Listowel. 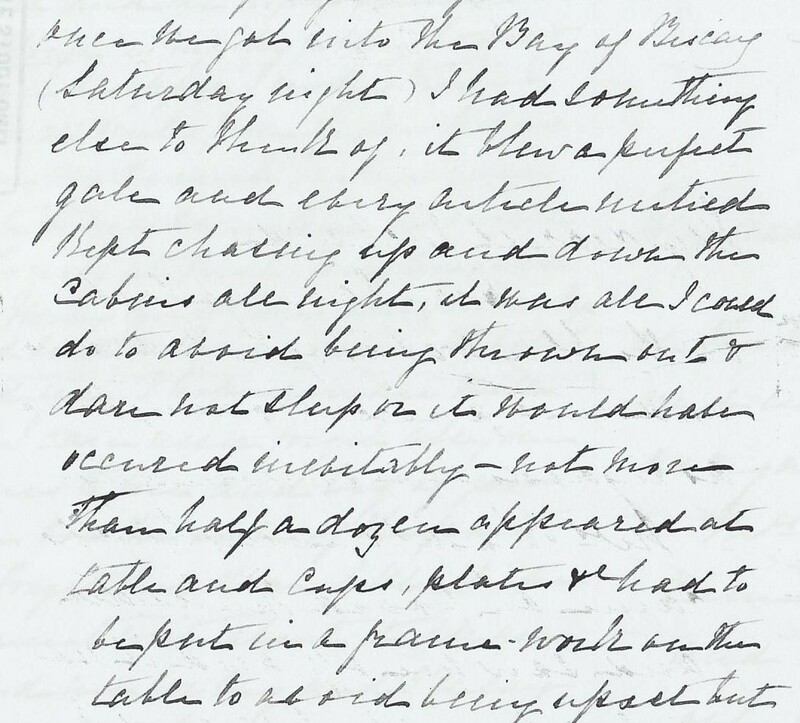 Letter from Jim O'Leary to Richard Rahilly, 7 Apr 1868, disapproves of him: "As to Dear Marianne, I am quite tired from advising her. If she marries Mr. Morris ... she is sure to be in poverty, and by no means happy". He is surprised Morris had the nerve to propose: "He must be encouraged when he presumed to ask her". But Marianne's brother Richard Rahilly is in favour. O'Leary says: "I was surprised when Marianne told me that you and Aunts were for Mr. Morris. All I say is of no use. ... Their minds are unsuited ... I am surprised that you and Aunts do not advise her". 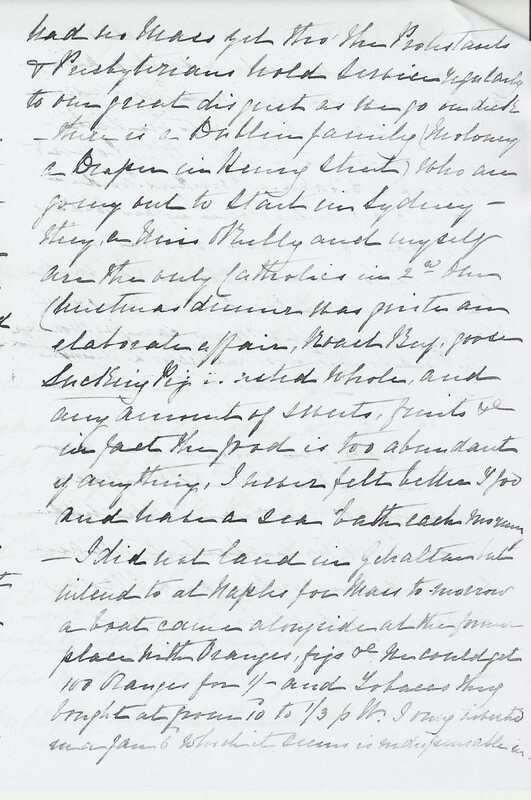 In fact, Robert Morris witnessed Richard Rahilly's own marriage on 13 June 1868 [GROI]. 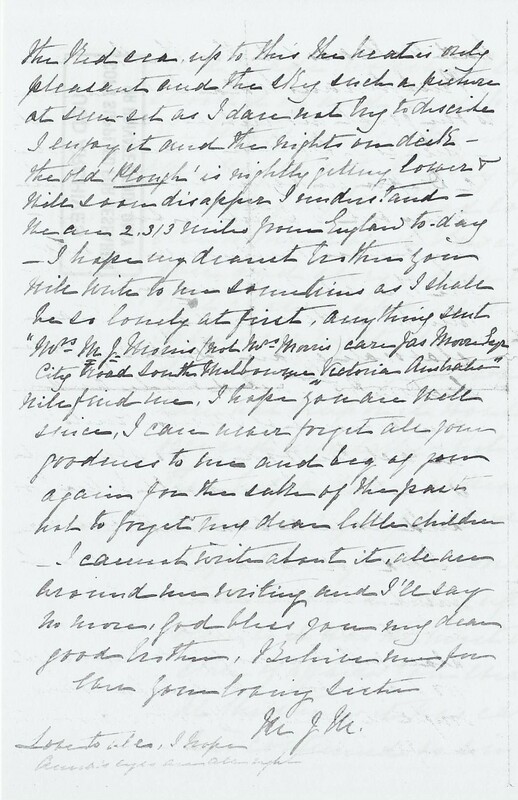 Robert mar 6 Oct 1868, Ballylongford, to Marianne Rahilly [born 1838-43]. At son's birth 1869 he is listed as "Excise Officer", living Listowel. 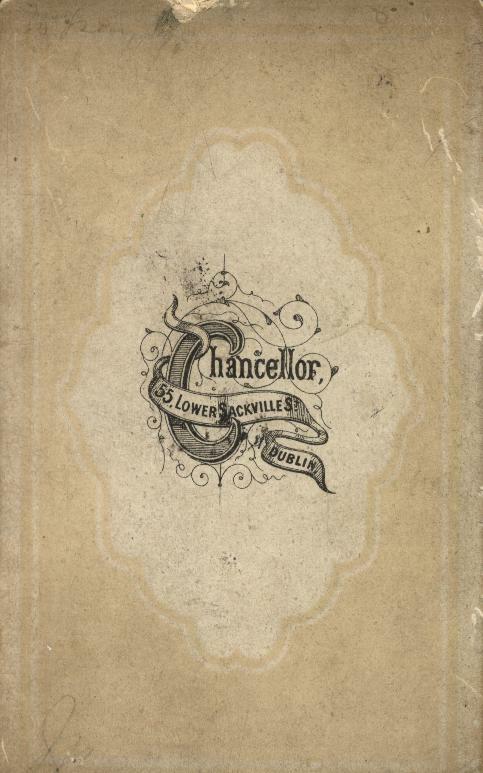 He is listed in [Slater's directory, 1870] as Inland Revenue Officer for Listowel, living William St. It was thought they maybe lived at one time in Waterford, but this may be confusion with Wexford below. At children's births 1875-77 he is listed as "Excise Officer", living Parsonstown (Birr), King's County (Co.Offaly). 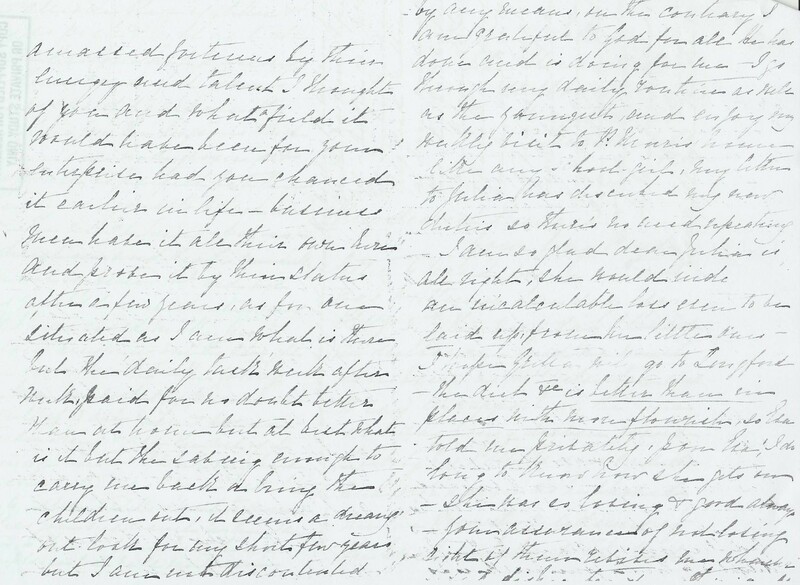 Marianne's aunt Margaret Rahilly (died 1877) left her her house in Ballylongford in her will. Still in Parsonstown (Birr) in 1880. [Slater's, 1881] lists Robert as one of the officers of the Excise Office in Parsonstown (Birr). He is listed at death 1881 as Inland Revenue Officer, late of Birr. He died Sun 25 Dec 1881, Dr Steevens' Hospital, Dublin [NAI], age 45 yrs. 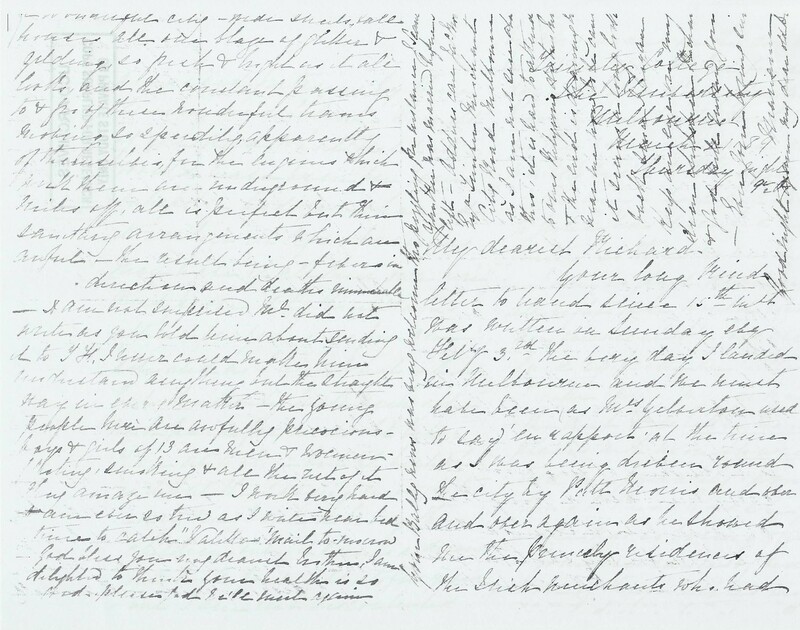 (todo) See death of Robert Morris, Dublin South, 4th qr 1881, age 46 (born 1835) [GROI] vol 2 p 523. Robert's will was pr 23 Feb 1882 at the Principal Registry, Dublin, by William Potter of Listowel, executor, effects £866 [NAI], will apparently burnt in Four Courts 1922. Marianne left Ireland and went to Australia in 1888. She left her children in Ireland. She wrote letter of Sat 29 Dec 1888 to her brother Richard, from the S.S. Liguria off Naples bound for Australia. They will be going through the Suez Canal. "Here I am at last on the blue waters of the Mediterranean and in a perfect floating palace". 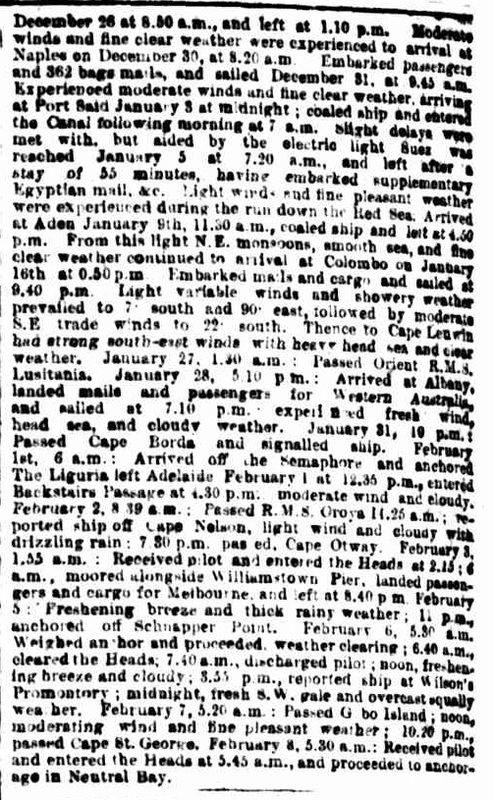 She says there was a storm in the Bay of Biscay on Sat night (Sat 22 Dec 1888). She says to Richard: "I can never forget all your goodwill to me, and beg of you again for the sake of the past not to forget my dear little children." She says her address will be City Rd, Melbourne (see map). She left her children at a "very good" school in Longford. 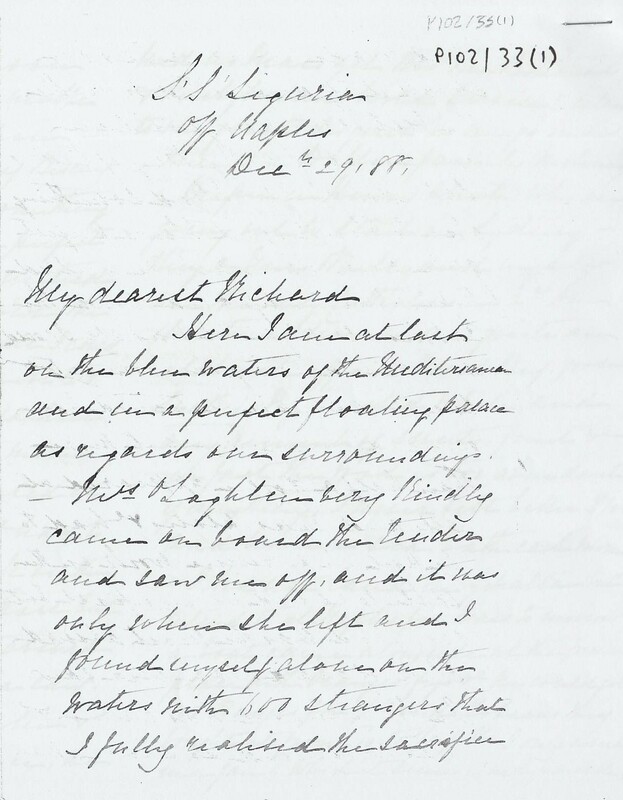 She wrote letter of Thur 21 March 1889 to her brother Richard. She writes from Trinity College in University of Melbourne. Unclear what she is doing. She says she arrived Melbourne on Sun 3 Feb 1889. Talks about saving enough to bring the children out. Asks Richard to "keep an eye on my dear children". She was planning to bring children out with her, didn't work out. She was always going away, had a wanderlust. She came back to Ireland. Her son Charles emigrated to US 1891-92. She sailed to America in Feb 1892 with her other children. She soon returned to Ireland. She went to live in the Convent of St.John of God, Wexford. Apparently there by 1893. 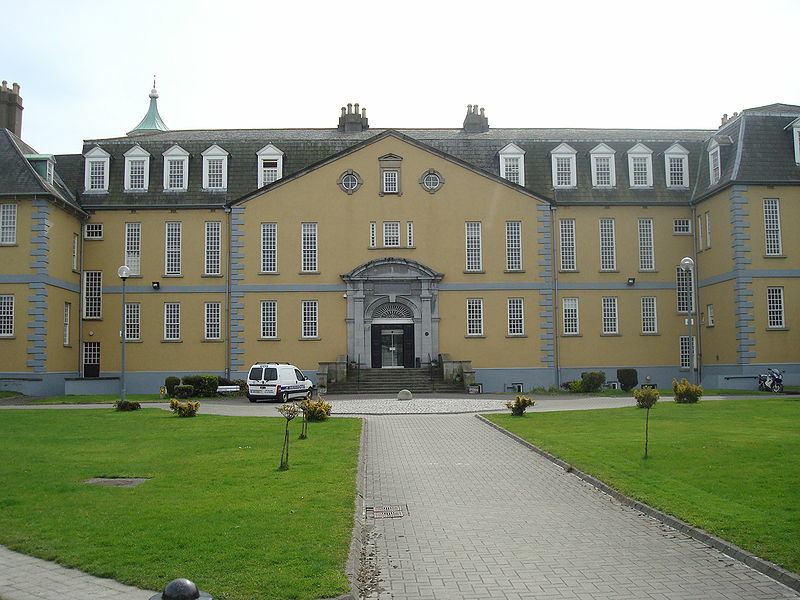 Her brother Richard (died 1896) made provision in his will (dated 1893) to pay from his estate the (tiny) sum of £30 per annum to the Convent of St.John of God, Wexford, to support her, so long as she remained a boarder at the convent. [P106/26] is a payment from Richard Rahilly's widow in 1900 for Mrs. Morris for a half year's maintenance at "St.Joseph's Home" (same place as Convent of St.John of God, Wexford). She is listed as "Mary Morris", age 63 (born 1838) in Convent of St.John of God, Wexford, in 1901 census. She and other women there are listed as: "No occupation, supported by friends". Richard charged his daughter Anno to look after his sister, and she did, as long as Marianne lived. She is listed as "Mary Jane Morris", age 70 (born 1841) in Convent of St.John of God, Wexford, in 1911 census. 1916 letter from Nell says she was "down to see Aunt Morris" recently. (todo) See letter of c.1918 in [P106/441] referring to "Aunt M." in Wexford. [Aodogán O'Rahilly] said: "My aunt Anno was paying a small annuity to her Aunt Morris in the 1920s or maybe even later". Anno said "Never undertake to pay an annuity to anybody because if you do they never die". She died 21 Mar 1921, Rockfield, Wexford [GROI], age 78-83 yrs. bapt 25 July [Listowel RC par records]. listed as age 17 in passenger record at Ellis Island in 1892.
mar 1900, New York, to John Dowling and had issue. listed as "May Morris", age given as 9, in passenger record at Ellis Island in 1892. Robert Morris listed in [Directory of Cork & Munster, 1867] as Inland Revenue Officer for Listowel, Co.Kerry. Robert Morris listed in [Slater's directory, 1870] as Inland Revenue Officer for Listowel, Co.Kerry. 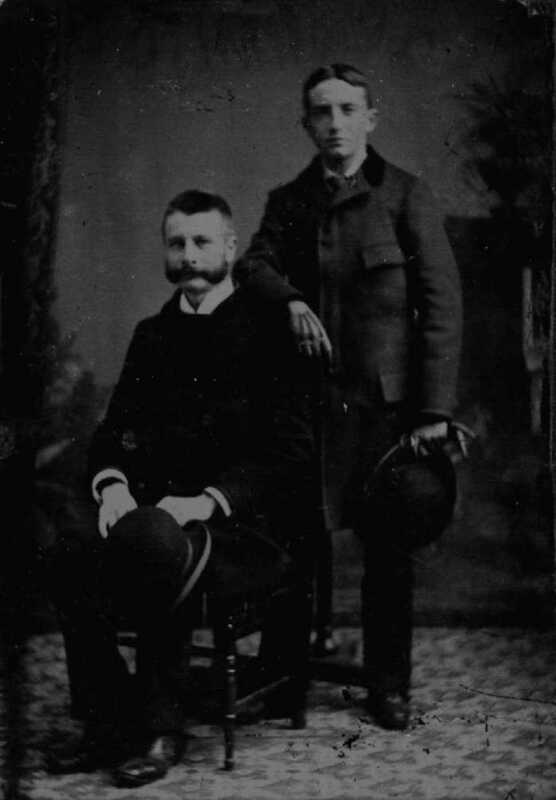 Robert Morris and his son Charles (born 1869). Must be shortly before Robert died in 1881. 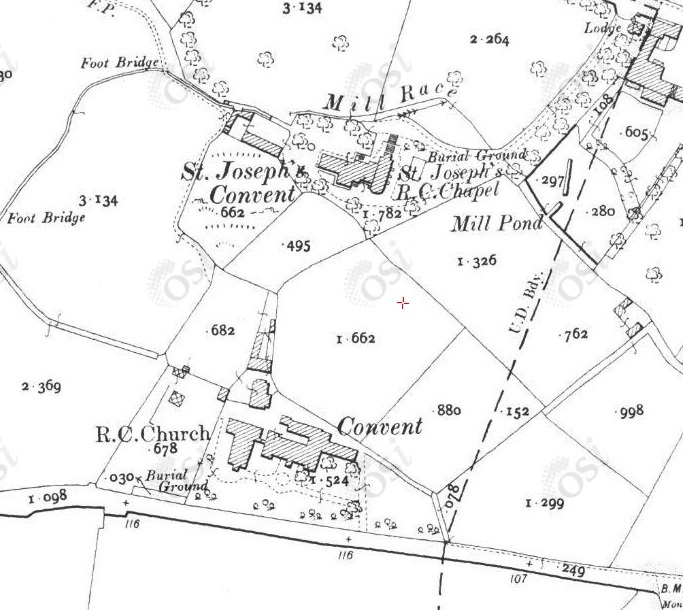 Convent of St.John of God, Newtown Rd, Wexford, on 1887 to 1913 map. Marianne apparently living there by 1893. She was living there 1900-1911. 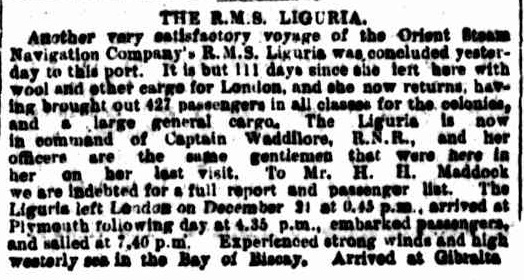 Voyage of the S.S. Liguria, Dec 1888 to Feb 1889. Sydney Morning Herald. 9 February 1889. 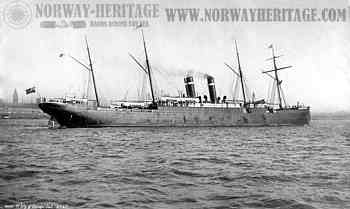 However, it is not the 1887-88 voyage. Marianne says she arrived in Melbourne on Sun 3 Feb. In the period in question, that can only be Feb 1884 or Feb 1889. Also, she says there were storms in the Bay of Biscay, which also matches the voyage above. The 1887-88 voyage had fine weather in the Bay of Biscay. Storms on Marianne's voyage: "it blew a perfect gale". Extract from her letter of 29 Dec 1888. 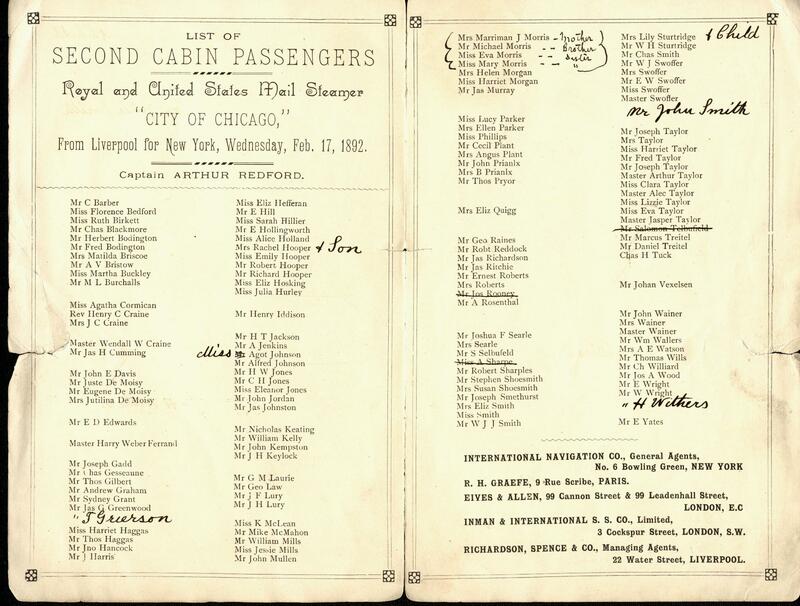 Extract from list of Second Cabin passengers sailing on the Inman Line steamship "City of Chicago" (built 1883). 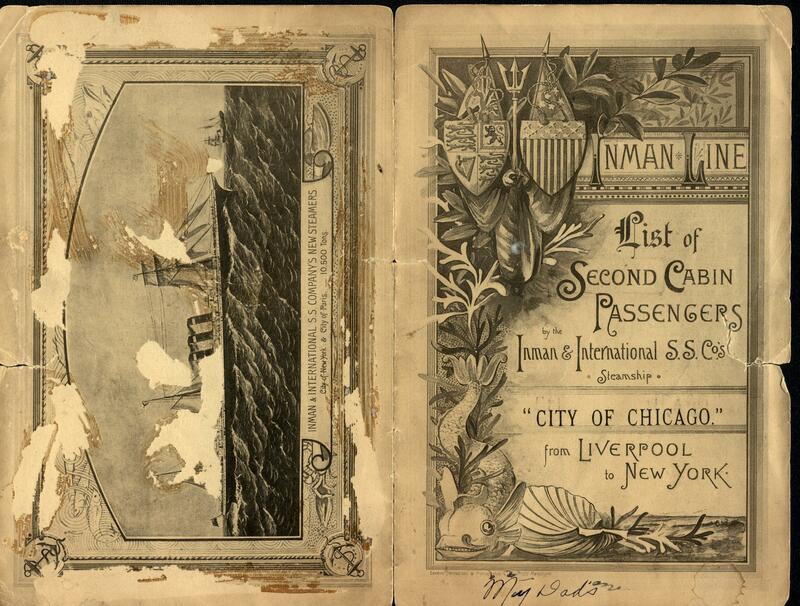 They departed Liverpool Wed 17 Feb 1892, via Queenstown, Co.Cork, arrived New York 27 Feb 1892. Passenger record at Ellis Island. See full size and cover. It was "Wrecked off southern Ireland" later in 1892.